Majd Abdulghani (M.S. 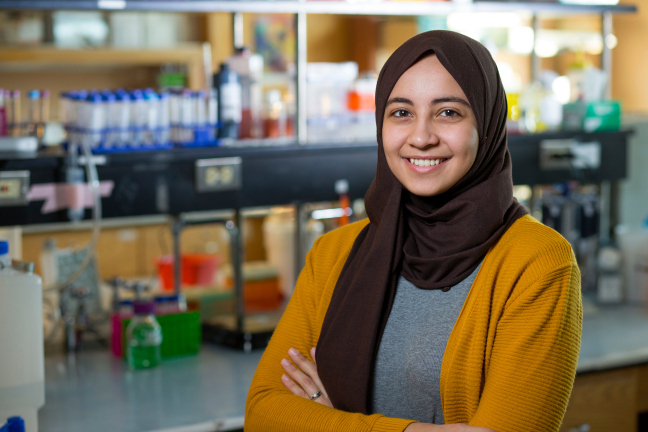 genetics and genomics ’18), an Iowa State University alumna and current research assistant at the University of Michigan, was selected as the first Rhodes Scholar from Saudi Arabia. She will join the 2019 cohort of 100 scholars. The prestigious international scholarships from the University of Oxford are awarded to outstanding students who demonstrate high potential in learning and leading. Abdulghani will receive at least two years of free tuition and fees, an annual stipend and travel to and from Oxford twice in an academic year. Rhodes scholarships are awarded in less than 25 countries worldwide. Abdulghani was a member of the Tuteja Lab while pursuing her master’s degree at Iowa State University. The lab, led by Dr. Geetu Tuteja, assistant professor of genetics, development and cell biology, focuses on transcriptional regulation and the genetic architecture underlying development and disease. Abdulghani’s Rhodes honor comes as no surprise to those at Iowa State who worked with her. In addition to her stellar academics (she finished her graduate degree with a 4.0 GPA), Abdulghani earned honors for her role as a global educator and advocate for women – in the form of a podcast. “Majd’s Diary: Two Years in the Life of a Saudi Girl” is a podcast she created to help introduce the world to what it is like to be a woman in a country with limited women’s rights. Officials from National Public Radio selected Abdulghani from a pool of 1,000 applicants to publish and air her story. The podcast won the 2017 Best Documentary: Silver Award at the Third Coast International Audio Festival in Chicago. Despite all of Abdulghani’s achievements, she remains humble about the scholarship. “I wasn’t expecting it at all, though I fantasized about what it would be like to win. I’m extremely honored and humbled,” she said. She built a strong network of support at Iowa State throughout the Department of Genetics, Development and Cell Biology, the College of Liberal Arts and Sciences and the university. Abdulghani will pursue a Ph.D. in physiology, anatomy and genetics at the University of Oxford. She plans to return to Saudi Arabia as a professor and hopes to help build the country’s research community and encourage women in the Arab region to pursue careers in STEM (science, technology, engineering and mathematics).